The Duke and Duchess of Sussex have launched their own Instagram account. 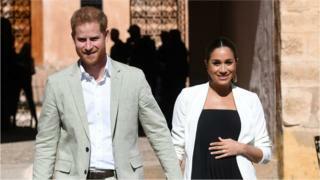 The official account for Harry and Meghan, sussexroyal, will be used for "important announcements" and to share the work that "drives" them.It already has hundreds of thousands of followers, with its first post including images of the royal couple.It comes as the duke and duchess, who are expecting a baby this month, split their household office from that of the Duke and Duchess of Cambridge.Meghan and Harry's support team will be based at Buckingham Palace, instead of Kensington Palace, from this spring. In their first post, Harry and Meghan said: "Welcome to our official Instagram; we look forward to sharing the work that drives us, the causes we support, important announcements, and the opportunity to shine a light on key issues. We thank you for your support, and welcome you to @sussexroyal." The first image was a navy background with the couple's royal cypher - the entwined initials H and M below a coronet - in white. A further nine pictures of them were shared, showing the duke and duchess on official visits around the world and of causes important to them. The included the couple watching a sailing competition at the Invictus Games in Sydney, Meghan embracing women at the launch of a charity cookbook for those affected by the Grenfell Tower Fire, and meeting fans on Australia's Fraser Island. 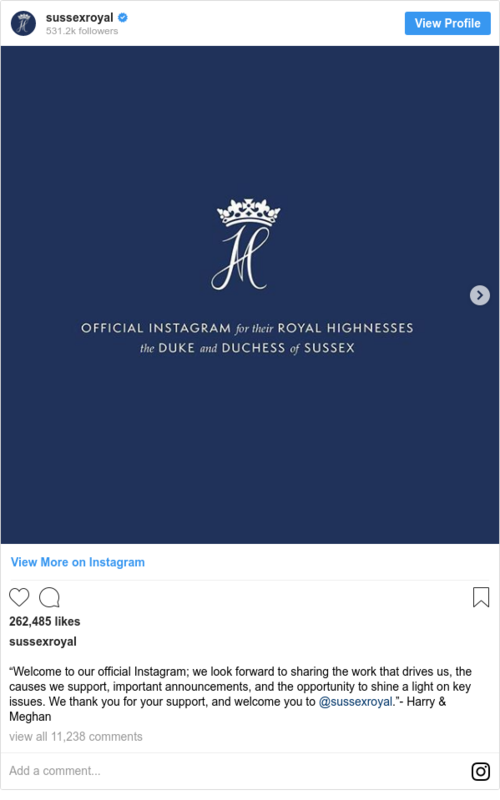 Sussexroyal is following a handful of other accounts - including those of other members of the royal family, as well as those representing their own charities and causes close to their hearts.Meghan's friend Jessica Mulroney was one of the first to welcome the couple's arrival on Instagram, commenting on their first post with two hearts. The duchess closed down her own personal social media accounts last year, before marrying Prince Harry. In December 2017, shortly after her engagement, she had 1.9 million people following her posts on Instagram, and more than 350,000 Twitter followers. Her Facebook page had almost 800,000 likes.Kensington Palace's Twitter feed introduced the new account, saying: "Welcome to Instagram, SussexRoyal! "William and Kate's Instagram, kensingtonroyal, has more than 7m followers.